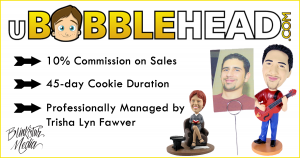 Blinkstar Media is pleased to announce that Trisha Lyn Fawver will be managing the uBobblehead.com Affiliate Program. We are excited to be launching this program exclusively in the ShareASale network. We have selected ShareASale for their overall high approval rating within the affiliate industry, their wide selection of affiliate tools, and their commitment to ethical performance marketing. Together with ShareASale’s arsenal of tools and Trisha’s years of experience, the uBobblehead.com affiliate program is sure to be a winner for affiliates. uBobblehead.com offers custom bobblehead figurines for all occasions. Figures can be created for men, women, children, couples, and even pets! The ordering process is simple. Customers can select a base bobblehead, chose customized features such as eye color, hair color, and more, then upload a photo for talented sculptors to recreate! Customized bobbleheads are truly thoughtful, personal, and creative gifts. uBobblehead.com offers themes like wedding couples, business professionals, sports players, musicians, military, kids, and much more. This is a terrific opportunity for bloggers. Affiliates will have access to tools, techniques, and training to contribute to their success. Affiliates are welcome to join the uBobblehead.com Affiliate Program in ShareASale without delay. Need assistance? Feel free to contact Trisha Lyn Fawver at affiliates@ubobblehead.com with your questions or requests.